Commencing today, paid-up MB subscribers will receive a monthly report summarising the month’s major statistical releases pertaining to the Australian economy. These are broken-down by topic below. Yesterday, Core Logic-RP Data released its home values results for February, which registered 0.45% growth at the 5-city level – the second consecutive monthly increase in values. 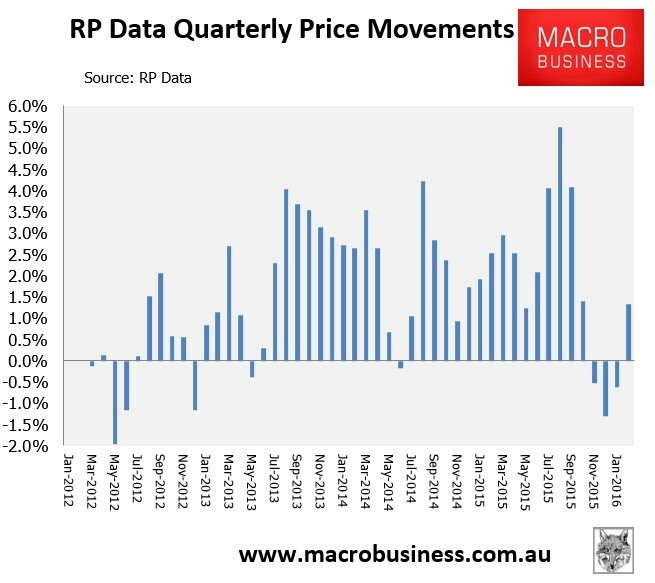 Quarterly price growth also rebounded to 1.4%, and was the first quarterly rise recorded since October 2015 (see next chart). 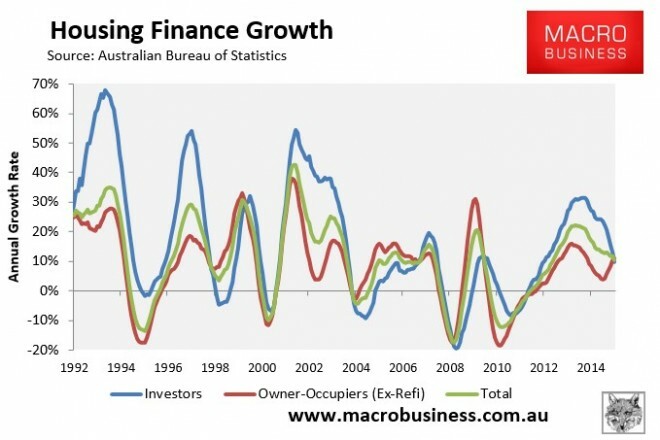 Earlier in the month, Core Logic-RP Data also revealed that the value of Australia’s housing stock had hit a record $6.4 trillion, and now accounts for more than half (52%) of Australia’s household wealth. 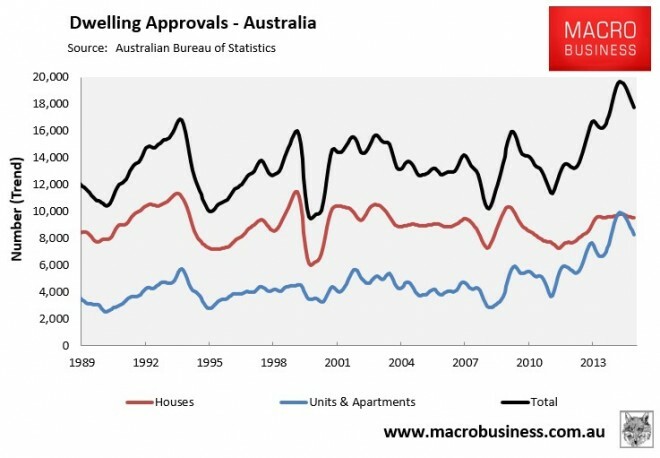 With Australian GDP running at $1.62 trillion in the year to September 2015, this infers a dwelling price-to-GDP ratio of just under 4 times – an unprecedented level – both domestically and globally. 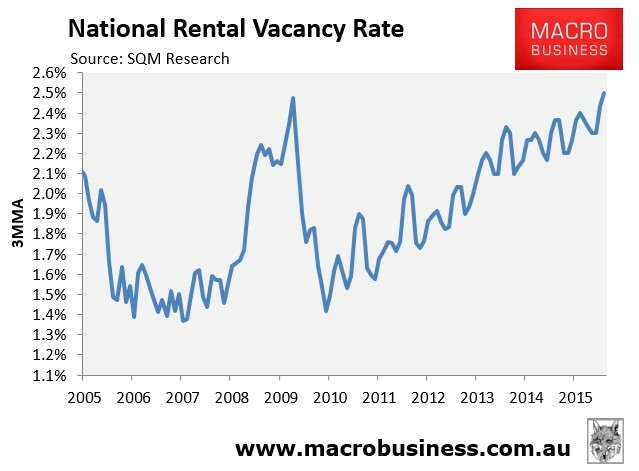 RP Data has previously stated that it expects more of the same in 2016, “due to increases in the supply of new housing, rental stock and a further slowdown in migration rates”. We at MB agree. 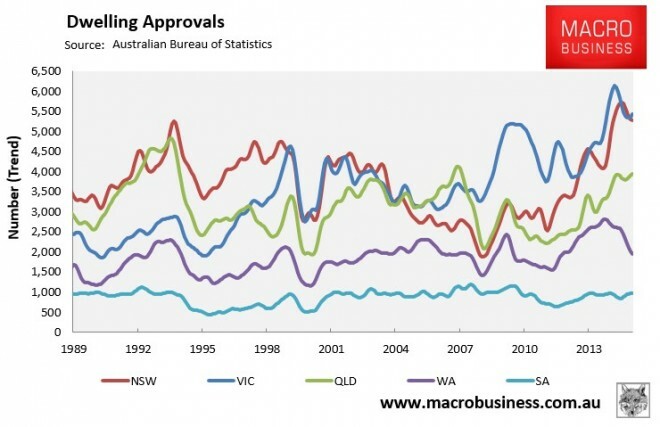 However, both approvals and commencements look to be topping-out. 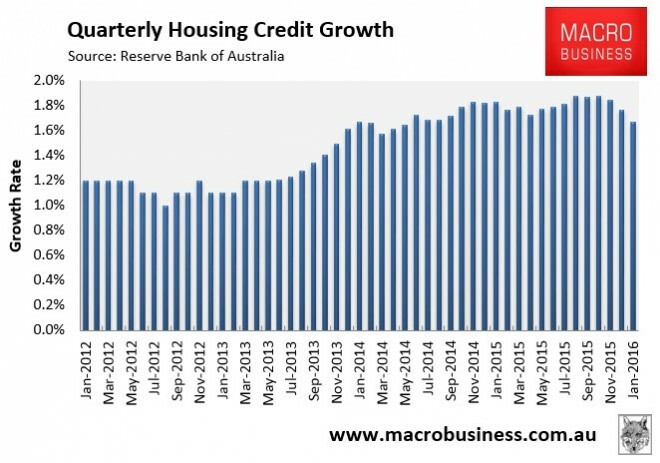 Turning to mortgage demand, housing finance came in stronger than expected in December, with the value of owner-occupied finance commitments rising by a seasonally adjusted 0.9% in December and investor commitments also rising by 0.6%. 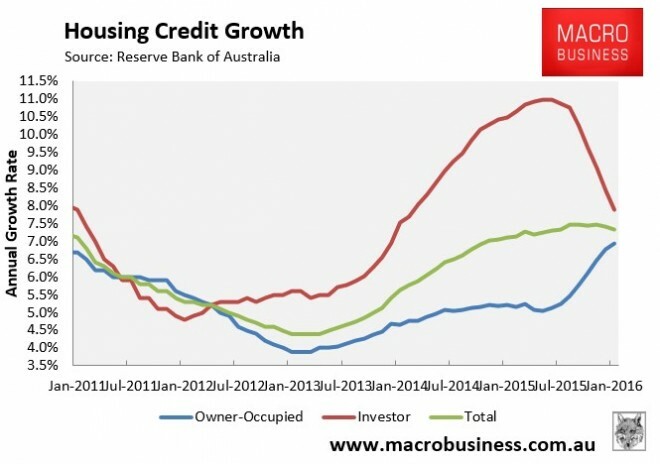 Other things equal, the falling growth in mortgage demand suggests that price momentum should weaken. The news around commodities remains dire. 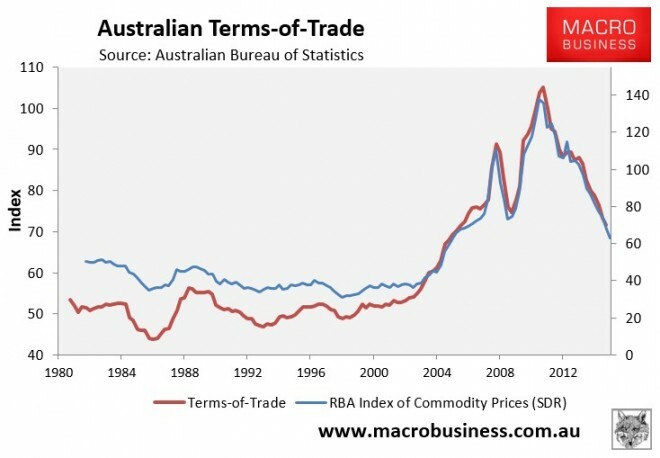 The commodity price index in SDR terms correlates well with the terms-of-trade (see next chart), suggesting that the national accounts for the December quarter, which are due for release tomorrow, will register more falls in the terms-of-trade, national income, and domestic demand. 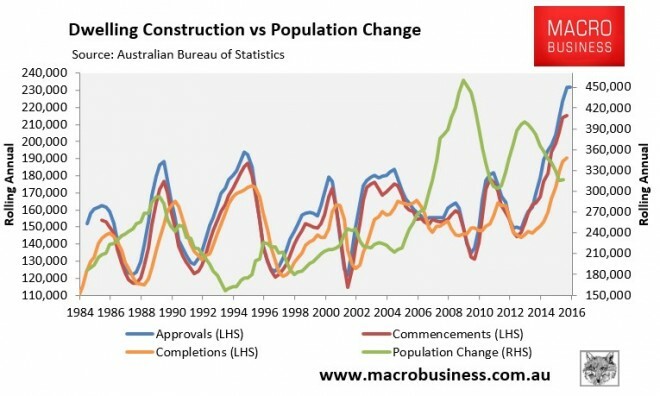 The ABS released its value of construction work done for the December quarter, which registered a seasonally-adjusted 3.6% slump in total construction activity over the quarter and a 4.3% decline over the year. 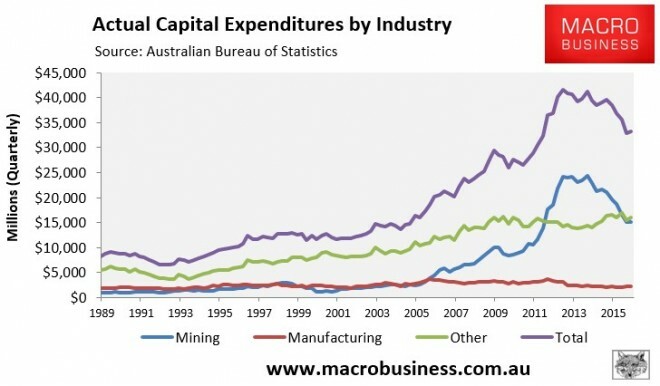 Somewhat contradictorily, the ABS’ capital expenditures (capex) survey registered a surprise 0.8% seasonally adjusted rise in actual capex over the December quarter, driven by a lift in “other” (services) capex. 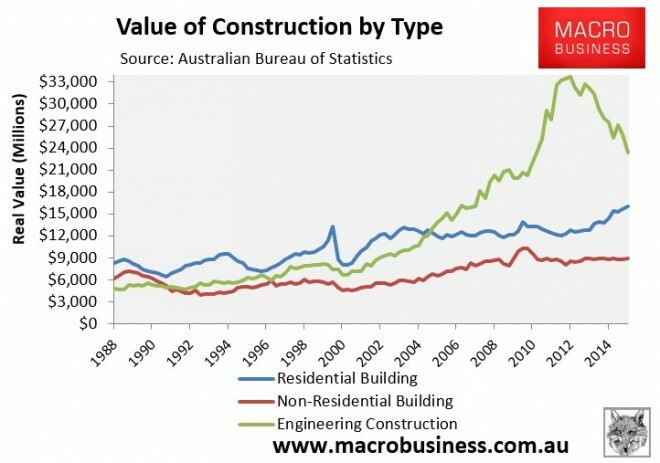 It is worth noting, however, that the value of construction work done is a more reliable indicator of actual activity and is what will feed into tomorrow’s GDP. In general terms, the capex survey is on a payments basis, which can throw up some odd results, whereas the construction survey is on a work done basis – that is actual activity in the period. 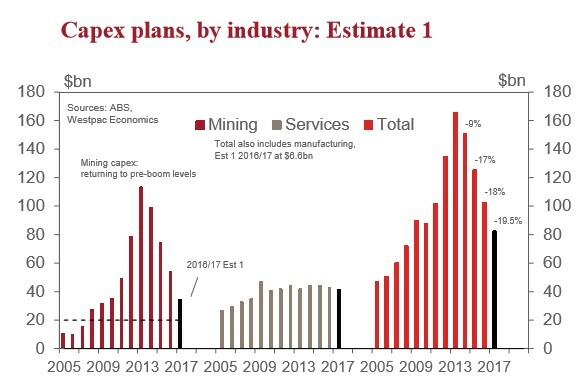 Regardless, the ABS’ accompanying survey of private business CAPEX plans for the 2015-16 financial year and the initial estimate of plans for 2016-17 was poor, with the expected upswing in services investment not forthcoming. The labour force data released in February was mixed. 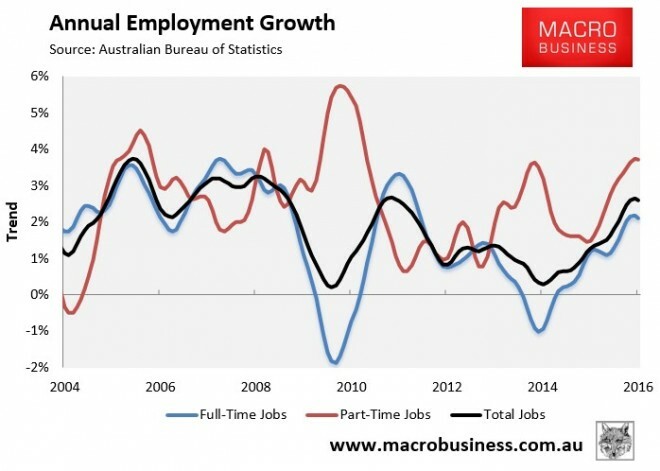 We expect the jobs data to continue to come in solid before turning downwards in the second half as the Sydney and Melbourne housing markets (both prices and construction) weaken, combined with the steeper falls in the mining investment and the closure of the car assembly industry from November 2016 (Ford) and continuing into 2017 (Toyota and Holden). 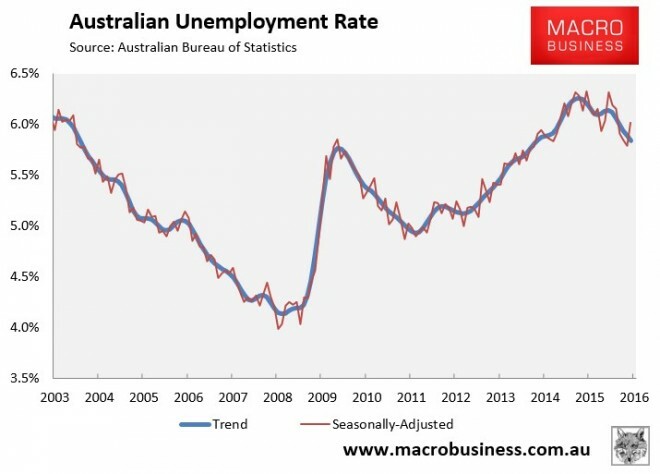 However, the true situation facing Australian workers is actually worse for two reasons. 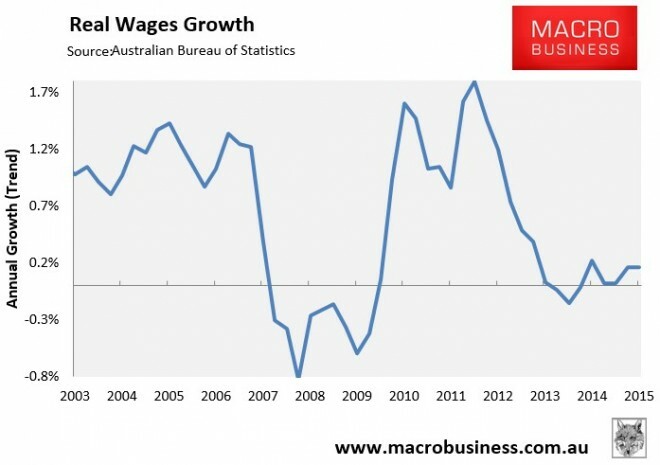 First, wages have to rise faster than CPI just to remain steady due to the effects of taxation (bracket creep). Second, the wages price index shown above measures like-for-like changes in wage costs for different industries, not changes in workers’ actual wages. And when adjusted for underlying (core) inflation, they fell by 0.6% over the year. 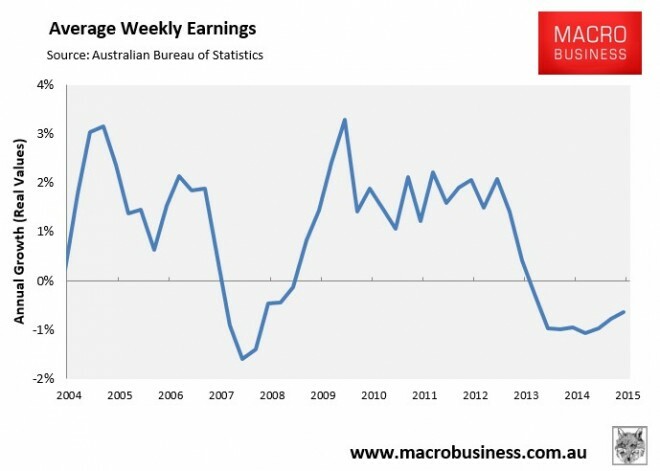 In fact, since May 2013, real average weekly earnings have fallen by 2.1% (see next chart). 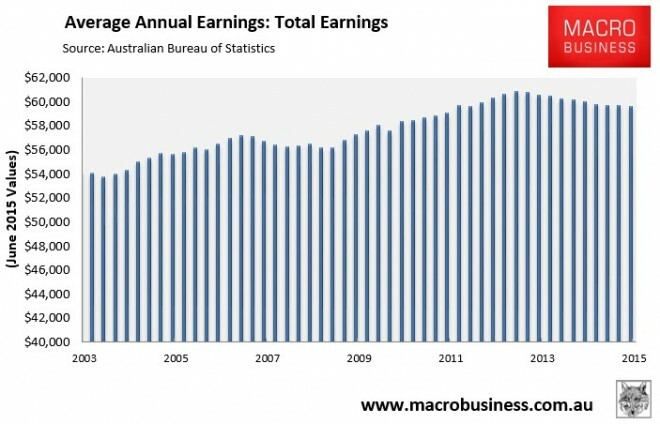 The reason for the real decline in AWEs is because of the rotation out of highly paid jobs, such as those that are mining-related, into lower paid jobs in services. 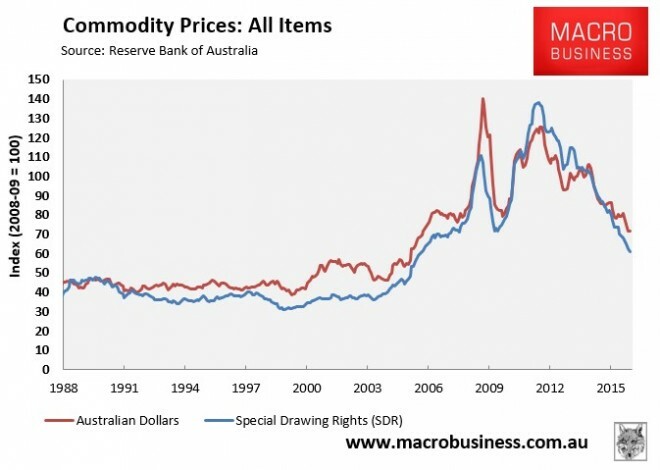 HSBC estimates that average wages in the services sector are about 40% lower than in mining. 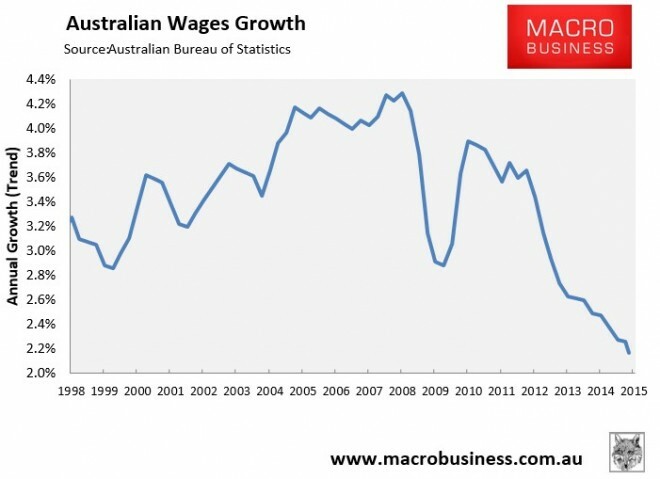 Thus, the rise in AWE has been dampened not just by slow wages growth in each industry, but because of the shift of workers into lower paying jobs. Unfortunately, this jobs rotation is likely to continue. 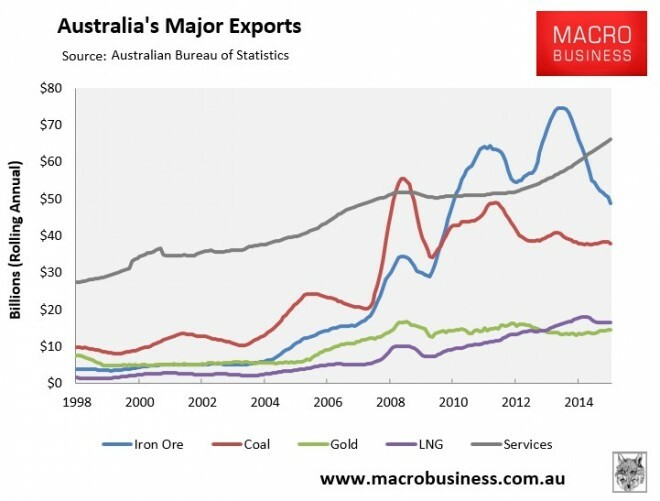 Mining investment still has miles to fall as LNG projects are completed (see capex charts above), and mines will very likely continue to slash employment to keep ahead of falling commodity prices. The economy slowed in February. Credit has fallen back from Q4’s breakneck pace after macroprudential measures. 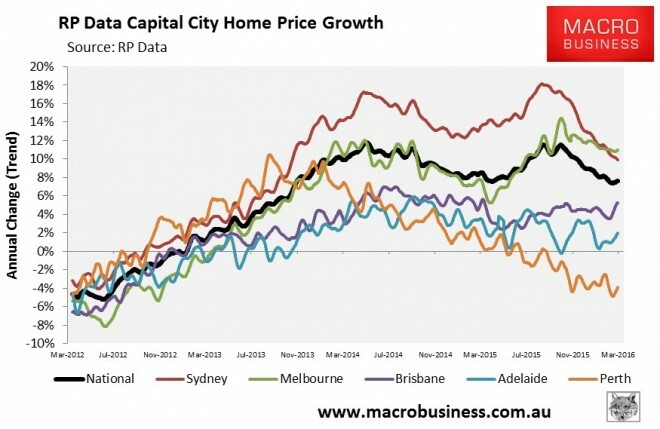 House price growth is falling back as well. The peak in residential construction is in sight with a steepening fall in its wake. 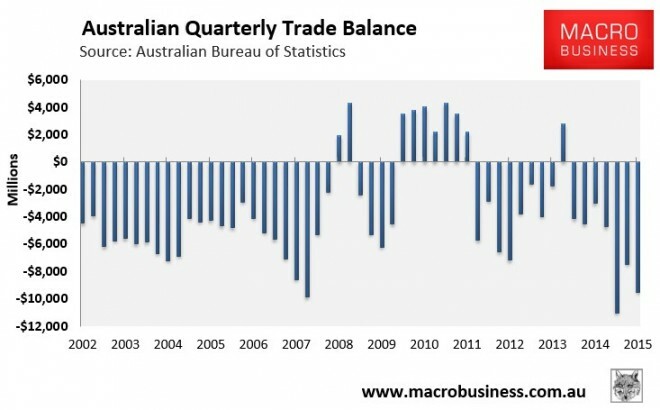 The terms of trade continue to fall sharply pulling down income and wages. 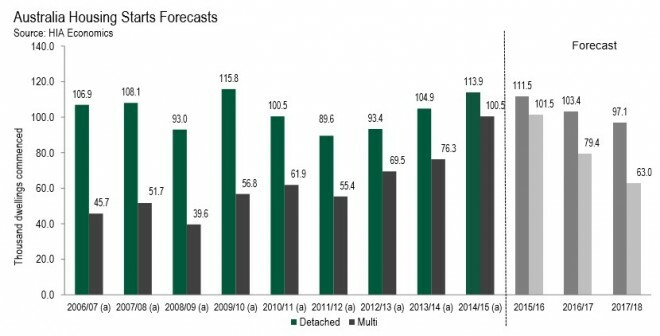 The mining capex cliff shows no sign of ending in the next two years and the hoped for offset in services is not materialising. 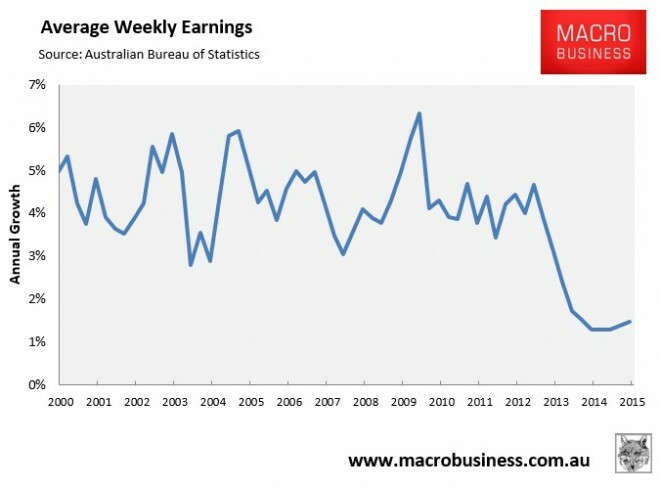 The labour market has begun to give back the ABS’s dubious gains. 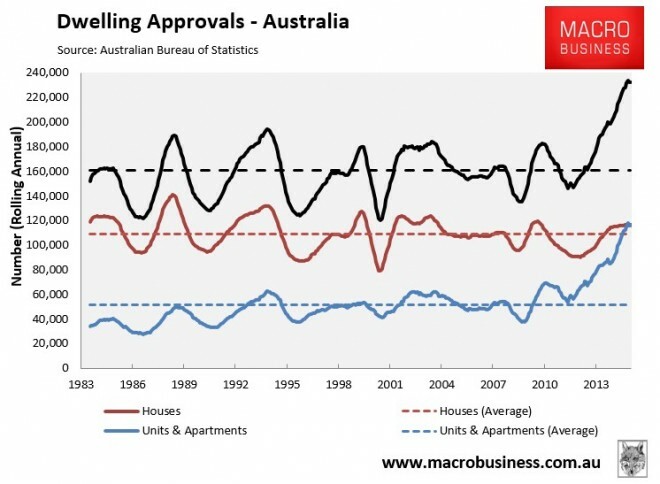 a housing market in which prices will stall and fall during the year.